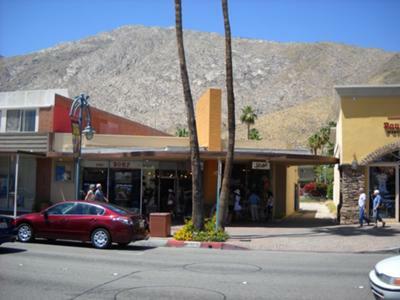 Palm Canyon Drive is the Main Street of Palm Springs, California, the desert community in the heart of the Coachella Valley of the Mojave Desert. Most of us think of Main Street as a charming thoroughfare full of shops, ice cream parlors, small restaurants, brick buildings and gathering places. 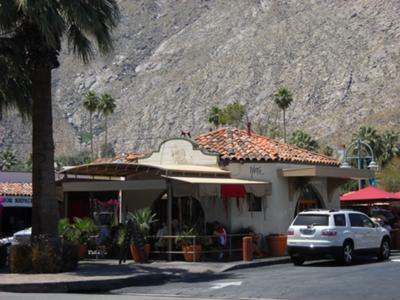 Palm Canyon Drive is all of this but in a desert setting, filled with old world Spanish-style buildings, tiled, arched walkways, and a touch of mid-century modern architecture as well. Palm Springs is a city of some 40,000 people which has been a focal point for tourist, celebrities, and retirees since it was first rediscovered from the local Native American tribes in the early 20th Century. The first major development of the downtown area was La Plaza, a white stucco shopping, housing and restaurant center that was built in the 1930s and still functions today. 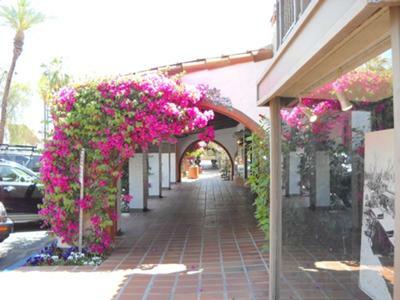 It is the center focal point of Palm Canyon Drive and is a combination of one and two story structures with balconies and red tile roofs. There's some lovely plantings here including flowering Bouganvelias and tall striking palm trees. A short walk away is the Plaza Theatre which hosts the Palm Springs Follies, a nostalgic musical review performed during "the season" which features showgirls who are all over 60 years old! Other architecture in the area includes the mid-century modern buildings, many with low profiles and interesting architectural features and building materials. These structures salute the 1960s heyday of Palm Springs and create an interesting contrast to the Spanish revival look. The street itself is alive with locals and visitors from around the world, year round. There are many wonderful restaurants, shops, and other delights. Every Thursday night, Palm Canyon Drive is closed off for the night market, where hundreds of people gather for a stroll to enjoy their neighbors and visitors, while partaking in the fresh produce of the area as well as the arts, crafts and performers found among the various booths. All of this adds up to a striking and warm redefinition of the traditional American Main Street. It's not to be missed, especially the night market, when visiting Southern California and this desert region of the Southwest.